Winter was ending and spring was just beginning to whisper her presence in our ears the day that this miracle was gifted to me, and through me, to you. 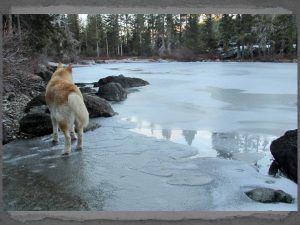 My wolfdog companion Ishnahnay and friends were walking the snow covered shore of Castle Lake in Mount Shasta, embracing the amazing beauty that we always found there. When in nature, I am often inspired to sing what comes from my heart. Today was no different. What came from me was a gratitude song of the beauty before us and the harmony in which we were choosing to embrace our nature family. It was all very lighthearted and joyful. Playing in the snow, visiting with the nature spirits, breathing in the glorious fresh air. Such blessings! As we walked along, me singing all the way, I looked into the water close to shore where the snow had melted, but a light covering of ice was still present with the water. As I looked, my eyes were engaged by this wondrous heart expression! The water was speaking to me. She was saying, "I love you too! Harmony, harmony, is indeed our song." At once I was One with the water, with the energy of Love, and at the same time I was in awe of the magic before me. 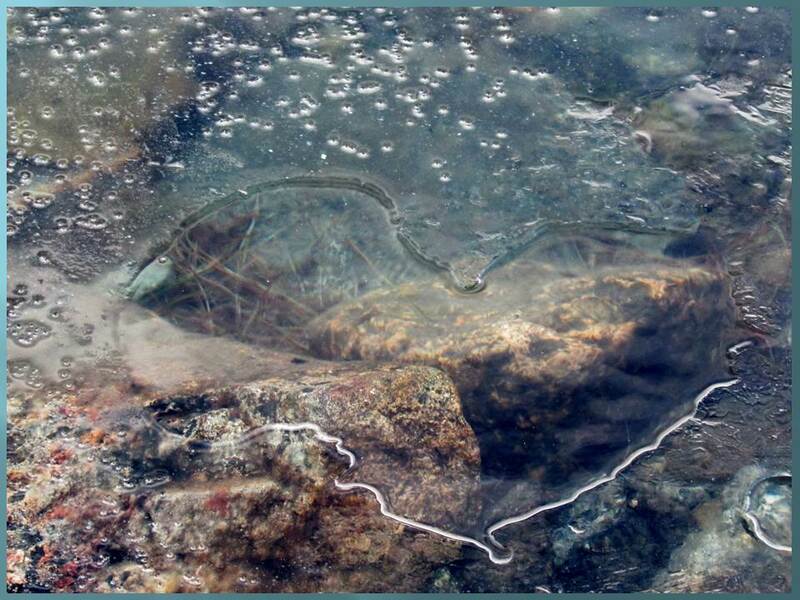 My thoughts went to Dr. Masaru Emoto and his revelations of the consciousness of water. "How delighted he would be to see this!" I thought. I have always been a great admirer of Dr. Emoto and the great courage and insight it took for him to bring the topic of consciousness in the physical plain to the public the way he did. In my continued state of elation and awe, I called to Ishnahnay and showed the heart to her. "Yes, she said, I see it too", smiling from ear to ear. We stood there together for quite some time, soaking up the energy of Love that was passing between us and the water. It was quite amazing! There is no doubt that all life is conscious and interconnected. All life is affected by what we say, feel, and do. So as you go about your day, I encourage you to remember that Love expands Light and brings it into its full potential in form. Share your love first with yourself and God/Creator, then with all of the world. A simple smile, kindness, or expression of gratitude to nature is a wonderful place to begin.